Vermont Online Bridge and Culvert Inventory Tool | Resource Systems Group, Inc. Working with the Vermont Agency of Transportation (VTRANS), RSG rejuvenated a web portal used to maintain the Vermont bridges and culverts. The former site, hosted by VTRANS, was an online database entry form that suffered from many issues due to construction using now-outdated technology and lack of maintenance over time. Major problems included security holes, data loss, poor data validation, lack of association with the Fish & Wildlife geomorphic database, and poor usability. Our rebuilt site, vtculverts.org, solves these problems and many others. 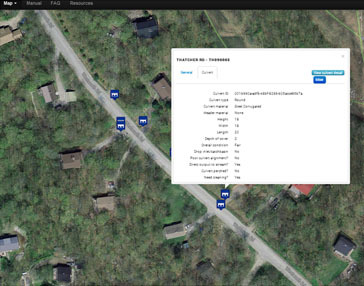 Vtculverts.org is built with the latest Microsoft server technologies and features a modern, map-based user interface. The new service is hosted as a secure cloud-based web portal and the database assets are now linked through ID to the state’s geomorphic database. Usability is greatly improved through online help and the system can be maintained and extended by the regional planning commissions themselves through a built-in content management system.